For many people, especially women, lower abs are an incredibly frustrating problem spot. The sad truth is that what most people do to deal with this problem actually makes it worse. Obviously, the single biggest factor in fat abs is body fat levels. 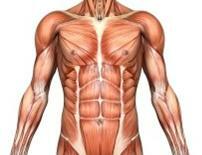 I know you know this, but remember this point – direct abdominal exercises will not burn fat off your stomach. Burning fat off your abs is about nutrition and how you train your whole body. Next to getting lean, the secret to getting flat lower abs correcting excessive anterior pelvic tilt. As someone who has done a ton of postural assessments over the years, I can tell you that even lean people can have lower abdominal protrusion. Next to body fat levels, fixing this postural misalignment is the biggest factor in how your lower abs look. Note: in both photos I'm facing to your right. I have my arms up to let the camera see my waist, so that is why my upper body looks kind of funny. How do you know if you have anterior pelvic tilt? If your pant-line from the side angles down, then you likely do, but it is best to get yourself assessed by a professional. Most people look to exercises such as lying leg raises as their lower abdominal solution. However, the problem with this exercise is that most people cannot do the exercise correctly and as a result, they end up over-developing their hip flexors and actually making their anterior pelvic tilt, and thus lower abdominal protrusion, worse! Minimize sitting. Sitting shortens the hip flexors and loosens the glutes – these are the exact two things you do not want to do if you want flat lower abs. Practice standing with a neutral pelvis. Most people stand with their glutes relaxed and their pelvis tipped forward. Instead, tuck it back to neutral and practice keeping it there. You can do that by keeping some tension on your glutes. As much as I'm a believer in corrective exercise, lifestyle modifications have a much bigger impact on posture. Get some manual therapy on your rectus femoris and hip flexors. Foam roll your rectus femoris and hip flexors. Check out this video for more information on how to foam roll. Learn how to activate your glutes. There are many tricks to this. One is to simply practice light glute bridges as an activation exercise prior to training. Practice full and complete hip extension in all your hip extension exercises (e.g. deadlifts, back extensions, etc). Well, that may not have been what you were expecting, but correcting excessive anterior pelvic tilt is the real secret to flat lower abs. It is also helpful for low back health and sport performance. Note for fitness professionals: I teach the personal trainers course for Health & Fitness Alliance. In this course we cover posture analysis and correction and well as a wide variety of other topics to help you help your clients look and feel there very best. Fore more information or to register, click HERE.